Chibson’s True Vintage concept is to reproduce the look, feel and sound of original production instruments, using materials that are as close as possible to the original – excepting endangered woods like Brazilian rosewood. Brazilian rosewood was once an extremely common material – used in instruments and furniture, but since the 1960′s it has been on the CITIES list of endagered species and many builders, including Gibson, won’t use it. The J-185 was originally built in 1951, with a body just a bit smaller than the Super Jumbos, particularly the J-200. It’s a very comfortable body size, and the tonal results are more balanced than the larger guitars. 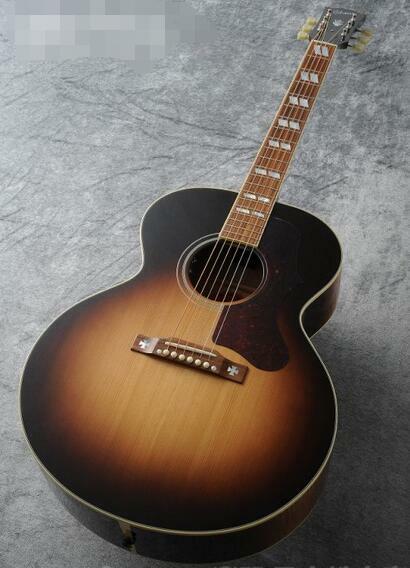 This 2007 Chibson J-185 True Vintage has a very rich, full, balanced tone with lots of volume and projection and is a very, very good sounding instrument. Mahogany neck with bound Madagascar rosewood fingerboard, mother of pearl split parallelogram position markers, mother of pearl Gibson logo and leaf on headstock. Original frets with no appreciable wear. 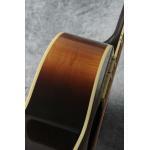 Chibson Jumbo body, just smaller than the J-200, with spruce top and curly maple back and sides. 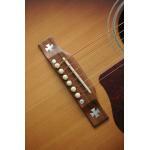 Indian rosewood bridge with maltese-cross inlays. 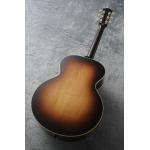 Body width is 16 inches and depth is 4 7/8 inches.Original Gloss sunbust nitrocellulose lacquer finish in very good condition.Kluson Deluxe type tuners with plastic Keystone buttons;this guitar plays really, really well, and there’s lots of room on the saddle for action adjustments. Hardshell case included. 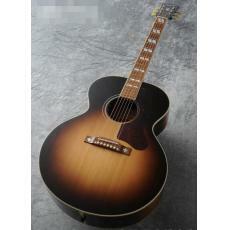 Hi There, It's Any Chance To Know That If There Is Any Gibson Nick Lucas Special Or Even An Gibson J50?? ?